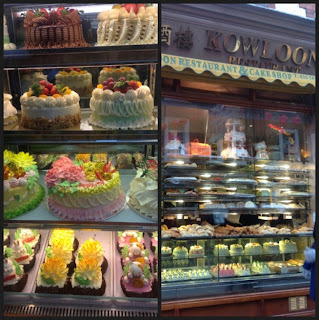 My tastebuds were calling for Dim Sum and Chinese cakery this week. Getting ahead of this weekends Chinese New Year celebrations was key, so I called out to Hercules to cease bench pressing the armoire, fire up the silver lady and get us to Chinatown pronto! As usual, we whizzed into town at lightning speed where I proceeded to spend an hour stuffing my face with all manner of steamed yummery. We then got high on sugary Chinese pastries, followed up with a little window gazing at Harrods and several hours of high voltage shopping. For those of you that I missed in January while I've been off galavanting, here's my second chance to say Happy New Year! was fun to check out these photos. wish I could eat all those cakes in the display, boy do they look good! Year of the Snake, my year :)) superb displays from Harrods as usual! Happy New Year Guys. Hope the pond project is going well. well Good Gosh Paul...are you clarvoiant? Ok...I can't spell it and don't have time to check it because I have to get my hubby at work..but you know what I mean...I was JUST thinking about you this morning and wondering just where in the dog you have been??? I was about to put out a blog APB for you being AWAL. Glad to see you've made it back around! I am thrilled to have been missed Gina. I took myself on a little vacation and came back to some huge projects but now I'm back on the soul train girl, pass me that tortilla mushroom thing! What an explosion of color! Great photos as usual, Paul. Harrods' windows are mesmerizing. Hi Amelia, they were mesmerizing. I left a good face print on the window gawking at them! I can see my snake hips very quickly becoming cake hips with all this sweet stuff Mr Loi. Happy New Year. "Steamed Yummery"!!! I loved that!!! Guess you are doing wreaths for this occasion as well.. vermilion, gold, citrus and purples...tassels...a hidden surprise of snake perhaps. Hi Bren, Glad to be back too. Happy New year! Wow, Chinese dim sum plus those Chinese desserts then a grand shopping time at Harrods looks like a perfect day to me. Never mind those scary snakes. I wish you all best in the New Year! Happy New Year Helen. I thought a nice injection of colour would banish the wintery skies. 10 house points Ms Gina. I knew you'd spell Clairvoyant correctly. Geddit, geddit, I knew, clairvoyant, oh never mind, at ease! Ohhhh I've missed you so much!! I hope your vacay was wonderful-- I'm sure it was! Welcome home boyfriend! Beautiful photos- the colors are so vibrant. You captured the colors perfectly-- I love all the reds! I hope it's not too cold over there-- it's always hard to come back from warm places to cold and snow. But I'm sure happy you are back! PAUL MI MAN! THE CHRISTMAS WREATH MAN! What gorgeous red windows, Paul. Love the dragon with the heelless stiletto feet and the street shots of Chinatown. I love dim sum, good winter comfort food, yum! Hi Cindy. Hope you had a great Christmas. Looking forward to catching up with your finds. Oh forgot, happy new year to you! Very happy to see you back on my sidebar Paul. Everyone has missed you. Are you going to let us in on where you have been galavanting? 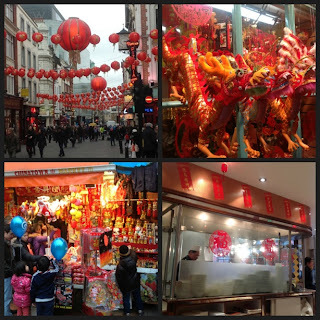 Lots of lovely Chinese images on your photos. Paul, Loved this! I'm impressed London has such a big celebration for Chinese New Year. It's big here in the Bay Area of course and it's customary for many to keep their holiday decor up until this point. We also get lots of goodies from our generous friends who celebrate! Love the snake!! Glad you are back. Hope you got some rest after the crazy Christmas season. Missed you! Good to hear from you again! Those window displays at Harrods look impressive. So colourful.